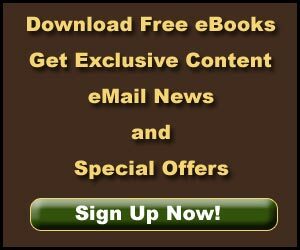 Unusual Lava Tube Caves - Explore! 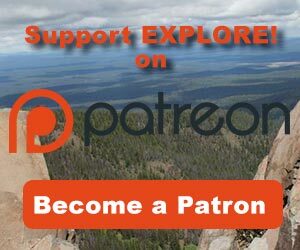 Unusual Lava Tube Caves - Explore! 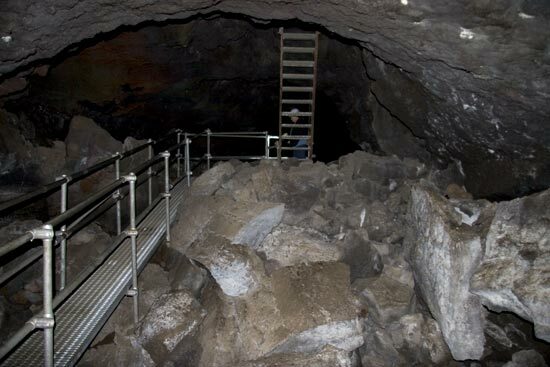 There are literally hundreds of lava tube caves with nearly 28 miles of underground passages that we could explore at the Lava Beds National Monument. We are NOT going to explore them all – just a few. We already looked at some easy caves. 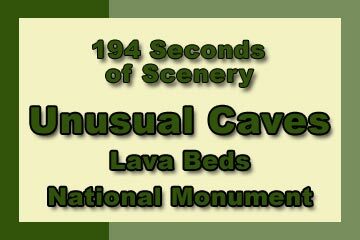 Here we will explore a couple of caves that are unusual in their own ways. As it’s name suggests and the photo shows, it has ferns growing in it. The nearest similar ferns are among the coastal California redwoods over 100 miles away. It contains extensive and very well-preserved pictographs on its walls. Fern Cave is located just off of the Lyon’s Road (now gated) south of Hospital Rock. To explore Fern Cave, you will need to make advance reservations. Group sizes are limited to six people and children under 12 are not permitted. There is only one tour per week and it takes about an hour. The tours meet at the Hospital Rock parking lot and participants are transported to the cave in a Park Service vehicle. The entrance to the cave is gated with steel bars and locked. A standard aluminum ladder rests nearby, also locked in place. Your Park Service guide will unlock a hinged portion of the gate, to the left in the photo, and slide the ladder into the opening at just the right angle so that it rests on rocks below and is locked into place at the top. The guides have explicit instructions on where visitors are allowed to go in the cave. You will be limited to the general area around the ferns, just below the entrance. Apparently these restrictions are a result of discussions with Modoc Tribal members and are intended to prevent damage to cultural and biological resources and interference with Modoc ritual activities. A small section of pictographs on the cave wall. Photo ©2010 Anders Tomlinson, All Rights Reserved. 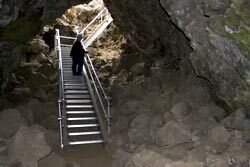 The cave has been used by the Modocs as well as their predecessors on this land. 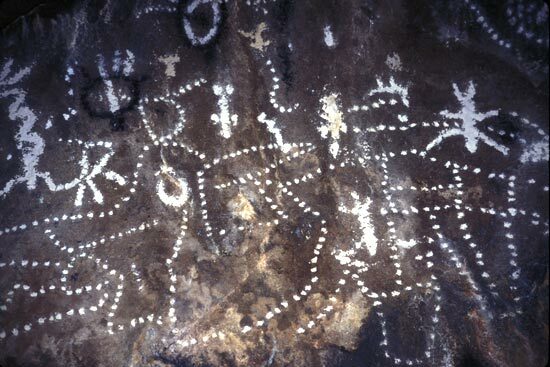 The pictographs on the walls of the cave are believed to be associated with native vision quests and other rituals. There are considerably more human-shaped figures, seen in the photo to the right, than typically found in Modoc pictographs, suggesting they either pre-date Modoc occupancy of this area or were drawn by a visitor. 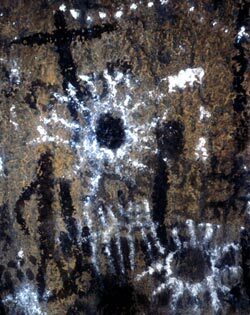 Two circles and a crescent on the west wall of the cave were once thought to depict a supernova that occurred in 1054, forming the crab nebula, although the position of the moon was incorrect. Scientists carbon dated the charcoal ‘paint.’ They found that one circle and the crescent were 230 to 380 years old. One of the circles could have been painted in 1054, but, by itself it isn’t believed to represent the supernova. We offer the two photos above and below to show how little, if any, degradation has occurred over an 80 year period. According to a Park Service report, human remains were found in two locations in the cave. The first was found in 1999 and included a funerary object. The second was found in 2003. They are located about 75 feet apart. Both are described as “incomplete, fragmentary and highly decomposed skeletal human remains.” Examination didn’t find any duplicate bones, so the remains may have been of one person. The remains were left where they were found and their exact locations are not available to the general public. These human remains are a key reason why public access to the cave is extremely limited. Our guide didn’t want to talk about it. Fern Cave Pictographs. ©2010 Anders Tomlinson, All Rights Reserved. Merrill Cave is located west of the main road, north of the Visitor Center and north of the road that leads east to Skull Cave. Charles H. Merrill homesteaded this area in 1917. Guy and Polly Merrill operated a resort near the cave for four years in the 1920’s and used the cave as one of its attractions. Visitors enjoyed ice skating by lantern light in the large lower chamber. The resort also offered tent cabins and an above-ground dance floor. During the prohibition era, Jim Howard produced moonshine in Merrill Cave. However, the big story associated with Merrill Cave is the disappearance of ice in the lower chamber. The Entry into Merrill Cave. Note the green on the cave wall to the right. The Park Service, on the interpretive panel at the cave, infers the loss of ice was related to global warming, however the record is not very supportive of that notion. Study of the mineral deposits on the walls of the lower chamber revealed that the ice level has fluctuated a great deal over the last few thousand years. The ice at some time in the distant past had been much higher then when settlers skated on it and the ice had held that level for a very long time. From 1958 to 1998, the ice levels were increasing. However, in early 1997 a pocket of air was noticed under the ice. By late that year, a tiny hole had formed in the surface of the ice, air was blowing out of the hole and shortly thereafter the ice level began to decline. With help from visitors that threw rocks and kicked on the ice, the hole enlarged rapidly. It’s not clear how the ice began to melt from below, but the possibilities include volcanic activity and changes farther down in blocked areas of the lava tube that allowed warm air to move upward and under the ice. One notion is that a September 1993 earthquake that caused significant damage in Klamath Falls and Tulelake may have shifted the rubble in the tube enough to begin the warming process. Surface condition records, beginning in 1946 showed slightly increased average annual high temperatures and decreased precipitation. Also, with the exclusion of fire, juniper trees have been growing in the area. The trees may be tapping into the aquifer and lowering water levels that would normally feed the ice-building process. All of these things likely played some role in the ultimate demise of ice in the cave. We saw moving and dripping water in the cave, so we suspect lack of water isn’t a problem. Note the various colors in this close-up of the cave wall. 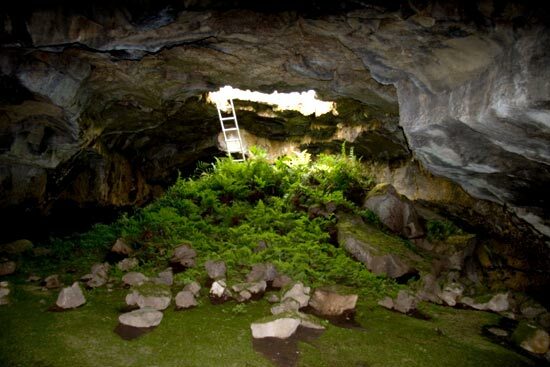 The cave itself was formed by a lava tube beneath another lava tube. This type of formation can lead to ice formation when cold, winter air is trapped in the lower levels and air flow is insufficient to dislodge the cold air in the summer. The upper and lower tubes are connected through a hole in the roof of the lower tube (or a hole in the floor of the upper tube, depending upon your point of view). The Park Service has constructed a stairway into the cave through a skylight, a ladder to the lower chamber (go down backwards and keep your head down! ), and a walkway to a platform overlooking what once was the ice floor. The cave is about 650 feet long. If, after exploring Merrill Cave, you would like to extend your adventure, try Bearpaw Cave, just upstream from Merrill Cave, as the lava flows. The road to the parking area goes over a natural bridge formed by a portion of the lava tube that did not collapse. 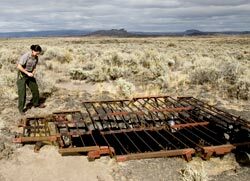 The first wagon road into this area came across the bridge and the general lack of water in the lava beds led visitors to stop there to get water from the ice in the caves. To serve them, a well was installed just inside the mouth of Bearpaw Cave. There are no ladders, walkways or other improvements, but you are free to explore. 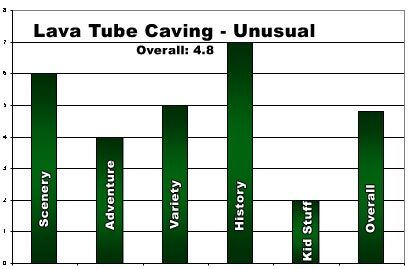 Our ratings for caves are not very comparable to those for other locations, but they will be consistent with caves. As compared to the ‘Easy Caves‘ the scenery is a bit better here with the ferns at Fern Cave and the colors at Merrill Cave. Still, the scenery is no match for what is typically seen in limestone caves. These caves are fairly easy to get into and around and don’t offer a major adventure. There is some variety in terms of the vegetation, rock colors, pictographs and historic uses of these caves. We rated this adventure higher in terms of history because of the prehistoric to present use of Fern Cave. The Park Service doesn’t interpret this very much, but the sense of history pervades the cave. The interpretive panel at Merrill Cave does give a bit of history. These caves won’t be particularly exciting for kids and those under age 12 are banned from Fern Cave. Overall, we rated this adventure 4.8 on our scale of one to ten. Except as noted, the photos are by Jerry Haugen, Pathfinder. Jerry also wrote the text and produced the video. Except as noted above, all materials are ©2010 Global Creations LLC, All Rights Reserved. Special thanks to Anders Tomlinson for permission to use some of his photos above and in the video. Our guide discouraged us from taking photos of the pictographs or shooting video in Fern Cave although there is no Park rule about it.